Draft: 2011, Texas Rangers, 17th rd. 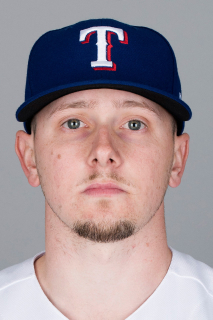 Ryan Anthony Rua...married Courtney Jarvis on 12/5/15...son, Rowan Randy, was born on 3/29/17…spent part of the off-season working out with the Amherst Steele High School baseball team in his hometown…is a fan of the Cleveland Browns…attended 2015-16-17 Texas Rangers Fan Fests and participated in the Winter Caravans. Was a member of the club's Opening Day roster for the 3rd straight season, but had over 100 fewer plate appearances in the big leagues than the previous season…had 4 stints with Texas: Opening Day-6/15, 7/31-8/11, 8/21-27, and 9/8-end of season…appeared in 63 games overall and started 36 games at 1B (19) and LF (17)…hit .262/.318/.377/.695 vs. LHP and .176/.273/.294/.567 vs. RHP…batted .202/.275/.343/.619 over 40 G in season-opening stint with the Rangers…was with the club from 7/31-8/11, but did not appear in a game…was 2-for-7 over 4 G/3 GS with Texas from 8/21-27…had 14 G/6 GS with the Rangers in September, batting .261 (6-23)…hit 1st career grand slam, 4/26 vs. MIN…no HR/one RBI last 34 G/19 GS with Texas. ROUND ROCK // Batted .266 (47-177) with 8 HR and 28 RBI in 46 games with Round Rock in 2017…hit .246/.278/.413/.691 during longest stint with the Express from 6/17-7/29…batted .333/.409/.641/1.050 over 12 G in final 2 stints at Round Rock. Batted .258 (62-240) with 8 HR and 22 RBI over 99 games, setting career highs in nearly every category while spending virtually the entire season with Texas…made the Opening Day roster for a 2nd straight season after a 1.092 OPS in 22 spring training games…opened the season in a reserve role, but emerged as the club's primary leftfielder for nearly 2 months after Ian Desmond became the club's every day centerfielder…finished the season as a backup, primarily appearing vs. left-handed pitchers…had 2 stints with Texas in 2016: Opening Day-8/9 and 8/16-end of season. Batted .193 (16-83) with two home runs and 14 RBI in a pair of stints with Texas: Opening Day-Aug. 7 and Sept. 12-end of season…the club's Opening Day leftfielder was sidelined just five games into the season after claiming the spot in spring training…missed nearly three months of action with a pair of foot ailments. Had contract purchased from Round Rock (AAA) on 8/29 and went on to place 2nd on the club with 14 RBI the rest of the season...started 28 games in LF (17), 1B (9), and DH (2)...made ML debut in start at 1B on 8/29 at HOU with 7th inning single off Jake Buchanan his 1st hit...went 6-for-31 (.194) over 1st 8 games before batting .377 (23-61) in next 16 contests, improving to .315 on 9/24...was 2-for-13 in final 4 games...hit safely in a season-high 6 games from 9/14-21, including career-best 4 hits on 9/19 at LAA...hit go-ahead, solo home run off Huston Street in the 9th inning of a 2-1 win on 9/21 at LAA...was 1st Texas batter ever whose first MLB home run was a go-ahead blast in the 9th or later...hit 2nd career home run with career-high 3 RBI,9/24 vs. HOU...his 14 RBI were 2nd-most among Rangers (Odor-16) from 8/29 through the end of the season...tied for 10th in A.L. in doubles in Sept. (7) and was among the Rangers September leaders in RBI (T1st, 13), doubles (T1st), and hits (T2nd, 28)...hit .387 (12-31) vs. LHP and .341 (15-44) on the road...went 7-for-16 (.438) with RISP and 2 out...handled 94 total chances at 1B and LF without an error...appeared in one game at 3B, 9/9 vs. LAA. Hit .247 (112-453) with 32 HR and 91 RBI in 127 games between Hickory (Low-A) and Frisco...tied for organization minor league lead in RBI and was 2nd in homers (T5th among all minor leaguers) and extra-base hits (60)...ranked among the South Atlantic League leaders in home runs (2nd, 29), SLG (2nd, .559), and RBI (4th, 82)…was a SAL mid-season All-Star...had a season-high 2 home runs in a game 6 times and a season-best 6 RBI on 3 occasions...was Texas' minor league player of the month for June, batting .298 with 10 home runs and 23 RBI in 24 games...batted .317 with 14 home runs and 38 RBI over 42 games from 6/1-7/26 to raise his average to a season-high .265...was promoted to Frisco on 8/8...hit .175 (11-63) with 4 home runs and 15 RBI over 17 games with the Surprise Saguaros in the Arizona Fall League. Placed among the Northwest League leaders in RBI (T5th, 43), total bases (6th, 121), doubles (T6th, 16), batting (7th, .293), and home runs (T10th, 7) at Spokane (Short Season A)...appeared in 74 of 76 total games...hit .341 with 27 RBI over final 34 contests. Ryan Anthony Rua...spent the part of the off-season working out with the Amherst Steele High School baseball team in his hometown...is a fan of the Cleveland Browns...attended 2015 Texas Rangers Fan Fest. November 2, 2018 LF Ryan Rua elected free agency. November 2, 2018 Texas Rangers sent LF Ryan Rua outright to Nashville Sounds. September 10, 2018 Texas Rangers activated LF Ryan Rua from the 10-day disabled list. August 27, 2018 Texas Rangers sent OF Ryan Rua on a rehab assignment to Frisco RoughRiders. July 28, 2018 Texas Rangers placed LF Ryan Rua on the 10-day disabled list. Muscle spasms in back. June 26, 2018 Texas Rangers recalled LF Ryan Rua from Round Rock Express. June 17, 2018 Texas Rangers optioned LF Ryan Rua to Round Rock Express. June 16, 2018 Texas Rangers recalled Ryan Rua from Round Rock Express. May 31, 2018 Texas Rangers optioned LF Ryan Rua to Round Rock Express. April 25, 2018 Texas Rangers recalled Ryan Rua from Round Rock Express. April 21, 2018 Texas Rangers optioned LF Ryan Rua to Round Rock Express. April 17, 2018 Texas Rangers recalled Ryan Rua from Round Rock Express. April 16, 2018 Texas Rangers optioned LF Ryan Rua to Round Rock Express. September 8, 2017 Texas Rangers recalled Ryan Rua from Round Rock Express. August 29, 2017 Texas Rangers optioned LF Ryan Rua to Round Rock Express. August 21, 2017 Texas Rangers recalled Ryan Rua from Round Rock Express. August 12, 2017 Texas Rangers optioned LF Ryan Rua to Round Rock Express. July 31, 2017 Texas Rangers recalled Ryan Rua from Round Rock Express. June 16, 2017 Texas Rangers optioned LF Ryan Rua to Round Rock Express. August 16, 2016 Texas Rangers recalled Ryan Rua from Round Rock Express. August 10, 2016 Texas Rangers optioned LF Ryan Rua to Round Rock Express. October 15, 2015 Ryan Rua roster status changed by Texas Rangers. October 8, 2015 Texas Rangers reassigned LF Ryan Rua to the minor leagues. September 12, 2015 Texas Rangers recalled LF Ryan Rua from Round Rock Express. September 1, 2015 LF Ryan Rua assigned to Surprise Saguaros. August 8, 2015 Texas Rangers optioned LF Ryan Rua to Round Rock Express. June 19, 2015 Ryan Rua roster status changed by Texas Rangers. June 4, 2015 Texas Rangers sent OF Ryan Rua on a rehab assignment to Round Rock Express. August 29, 2014 Texas Rangers selected the contract of LF Ryan Rua from Round Rock Express. June 25, 2014 3B Ryan Rua assigned to Round Rock Express from Frisco RoughRiders. March 1, 2014 3B Ryan Rua assigned to Texas Rangers. August 8, 2013 3B Ryan Rua assigned to Frisco RoughRiders from Hickory Crawdads. April 3, 2013 Ryan Rua assigned to Hickory Crawdads from Spokane Indians. June 13, 2012 Ryan Rua assigned to Spokane Indians from AZL Rangers. June 29, 2011 Ryan Rua assigned to AZL Rangers from Spokane Indians. June 11, 2011 Ryan Rua assigned to Spokane Indians from Texas Rangers. June 10, 2011 Texas Rangers signed SS Ryan Rua.